Help! My Water Heater is Making a Knocking/Rumbling Sound! Is your hot water heater making odd noises? Is it knocking and rumbling so loud that it could wake up the neighborhood? Don’t worry! We’ve got you covered! The issue can likely be fixed without replacing the whole unit. Typically a noisey water heater is caused by excessive sediment build up in the tank. Think of minerals like calcium and calcium, and disolved metals like iron. 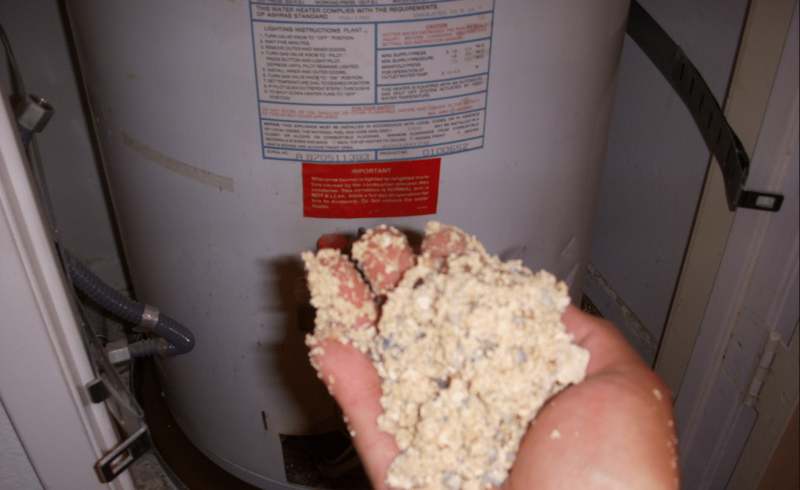 When “hard water” flows into a hot water heater unfiltered, a thick layer of sediment can build up inside the tank. That sediment causes water to become trapped right atop the heating element at the bottom of the tank. When the heating element is turned on, water heats up and begins to boil. That boiling water creates air bubbles that bubble and bubble until, bang!, boom!, rumble!, they finally escape the sediment layer. This is no different than a pot filled with water on a stove. If that pot is filled to the top with water, covered with a lid, and brought to a boil, the lid will shift and jump and bounce. The same thing is happening within your hot water heater. Oh, boy! Is My Water Heater Gonna Explode? Rest assured that your hot water heater will not blow up! However, excess sediment build up can cause a whole host of problems aside from the knocking in the tank of course. Over time sediment will undoubtedly cause deterioration which can lead to water leaking from the tank. Once this happens you will likely need to replace the entire water heater. Another issue that can arise within electric hot water heaters is damage to the heating element. Burned out heating elements are not an uncommon occurance. However, you will know if this has occured because the noises you were hearing will suddenly stop and your home will lose all hot water. So How Do I Get My Water Heater to Stop Playing Percussion? While draining and flushing the water heater yourself is an option, it is not recommended. There are no shortage of articles online that give step by step instructions on how to do this. However, the risk involved when trying to perform this relatively inexpensive task on your own is not worth the reward. Our recommendation is to give a plumber that is licensed in Mesquite and Dallas Tx a call. You can receive a quick and easy quote right over the phone and save yourself the hassle of becoming an internet-water-heater-expert.